This afternoon I was doing my usual daily research on the Web and Twitter when a Tweet popped up via TweetDeck: “A new personal email service -> Say Hello to Outlook.com, New Modern Email from Microsoft.” Like any intrepid journalist, I clicked the link. What I saw next scared me a little bit. After clicking the link, I was automatically logged into my 12-ish year old Hotmail.com account (which I do still use), except it had the Outlook.com interface. As you can imagine, this was a bit confusing. I was not currently on my Hotmail.com account page on another tab, nor was I logged in. Yet somehow, it sent me right to my mailbox — no username or password required. 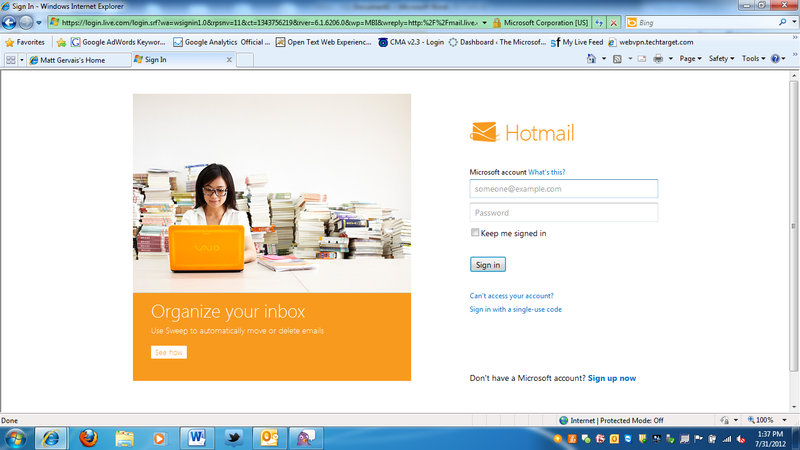 When I signed into Hotmail.com, I got a very similar page (except for a fun orange color scheme). While I appreciate what Microsoft is trying to accomplish with Outlook.com (see improved social networking capabilities, document editing capabilities, chat and more), I found it peculiar that I was logged into my Hotmail mailbox (with Outlook.com interface) immediately after clicking the Outlook.com link. Further investigation shows that anyone with a Hotmail, Yahoo, Gmail, etc. 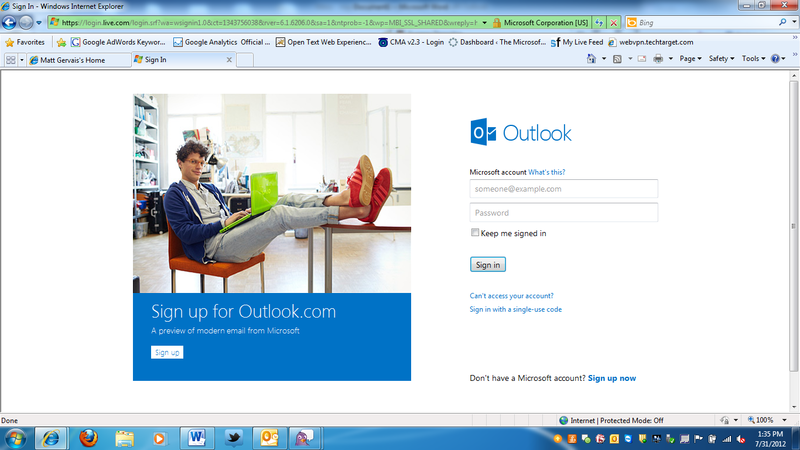 email addresses can now use Outlook.com. If you sign up for Outlook.com, you can set it up so that your Yahoo, Gmail, etc. messages get forwarded to Outlook.com. Microsoft further states that: “This will let you use both services for now, but we think that over time, most people will prefer Outlook.com;” an obvious power play. On a related note, Yahoo is currently experiencing an outage. I’ll be interested to read/hear what more people have to say about this, but right now it’s a little disconcerting. *Update: Aug. 1 8:45 A.M. (ET) – I went to the hotmail website and signed into my account; when my inbox loaded, it was Outlook.com. I don’t like that at all.